Well, here we are, August 3. We’ve just started what is technically the last month of meteorological summer, and it’s usually the hottest one as well. Temperatures were tolerable yesterday but this weekend forecast proves summer’s still here. There’s still a lot of moisture in the air, especially in areas that saw some scattered showers yesterday, and it’s in those areas where we may start the day with a bit of patchy fog. But once the fog clears we’re in for a mostly sunny, albeit warm and muggy, day. We’ve got winds out of the south and that means higher temperatures and dew point values. Highs should top out just a hair below the 90º mark. A fairly average summer day. Thanks to the juicy atmosphere, lows should only fall to around 70º or so, under mostly clear skies. If you’d like one more day at the pool before school starts back, tomorrow is your best bet as mostly sunny skies continue to reign overhead to start the weekend. Temperatures will remain warm and the air will remain muggy, perfect for a weekend dip in the pool. Highs top out right around 90º again under mostly sunny skies. Well, Scooter, we can’t completely rule out an isolated shower, but those chance are quite slim as of now. Just don’t forget the sunscreen. Nighttime lows fall back to around 70º once again with mostly clear skies once again. Heat of the afternoon showers and thunderstorms are back as we start to close out the weekend. Warmer temperatures and deeper moisture will allow your typical summer afternoon storms to bubble up to round out the weekend. 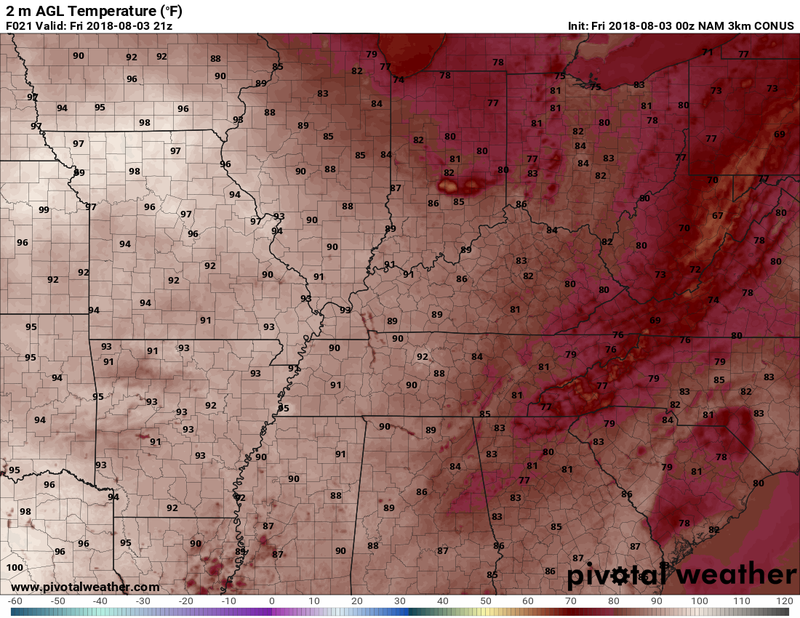 Highs right around the 90º mark are expected and with dew points nearing 70º, heat indices will get closer to 95º for those who manage to escape a storm. Storms diminish overnight, as we fall back to around 70º for a low. Soggy will be the keyword as we start the first full week of August with near daily rain chances of showers and storms coming along with the summer-like heat and humidity. At this point, Tuesday looks like the best chance for more widespread rainfall but we’ll likely fine-tune that in the days ahead.